Change is traumatic for cats, and moving house is particularly difficult, given the intense way in which cats bond with their environments. The following tips will help you ensure your cats safety and peace of mind before, during, and after a move to a new home. Update identification tags and make sure that the cat wears her collar regularly. Microchipping is also recommended. If the cat is already microchipped, call the company to inform them of the new address and contact number. Purchase a harness and leash if the journey to the new home will be a long one. Having this equipment will make it possible to let the cat out of her carrier for food and litter box options at some point without worrying that she’ll jump out of a window and become lost in a strange area or get hit by a car. In the case of a nearby move, provide current neighbours with the new phone number so that they can call if the cat returns to the old neighbourhood. Let the new occupants of the old home know that the cat might come by; provide contact information so that they can call if the cat shows up, and ask them not to do anything that would confuse the cat and encourage her to stick around, such as feeding her. Take some good quality photos of the cat. That way, if she goes missing during the move, there will be a much better chance of getting her back using posters with her picture on them. Learn where the nearest veterinarian is in the new neighbourhood, or update contact information with the current veterinarian if moving somewhere nearby. Make sure that the cat’s vaccinations are up to date. If possible, pack belongings slowly over the course of weeks rather than all at once. Gradual changes are less frightening for the cat than seeing all of her owner’s belongings frantically hurled into boxes at the last minute. Either arrange to have the cat boarded at a good cattery or with a friend or family member for a couple of days, or prepare a room (preferably the bedroom) where the cat will stay while furniture and other belongings are loaded into the moving van. A few days before the move, start feeding the cat in that room, and bring more and more of her equipment, such as her bed, litter box, and cat carrier in there. Don’t throw away the cat’s old familiar items. It’s best to start at the new home with the original food dishes, cat toys, and other beloved objects. Even if it’s tempting to discard that ratty old blanket or chipped bowl, if the cat loves it, bring it along as a comfort item. Old items can be swapped for new later on once the cat has grown accustomed to the new environment. Help the cat grow comfortable with car travel in advance to make the journey to the new home less traumatic. Use a cat pheromone diffuser product such as Feliway to reduce stress in the time leading up to the move, and particularly on the day of the move. Moving day can be terrifying for cats, as it involves radical life changes, vehicular travel, and invasion of their home by strangers. Some exceptionally nervous cats do better if placed in a cattery or boarded with a friend or family member the day before moving and collected the day after, but most cats can manage a move alright if steps are taken to protect them from its most anxiety-provoking aspects. Place the cat in a single room, preferably the bedroom, with her food and water bowls, litter tray, cat carrier, and any cat furniture she owns, such as a cat bed. Make sure doors and windows are shut. Place a note on the door to let those who are helping with the move know that the door must stay closed. Provide a small meal and clean the litter box. Line the cat carrier with a towel or blanket and spray the interior with a calming pheromone spray such as Feliway(preferably about 30 minutes before putting the cat in the carrier). Place the cat in her carrier and bring the contents of the cat room to the van once everything else in the house has been loaded. 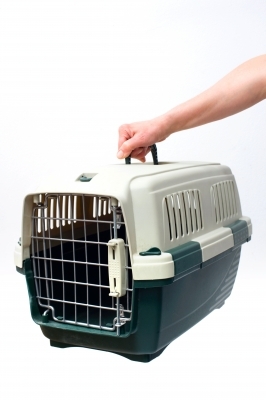 After all other items from the cat room have been loaded, bring the cat in her carrier to the car or van. If embarking on a long journey, be sure to keep an extra blanket or towel handy, along with some paper towels and a non-toxic cleaning product, in case of accidents along the way. The cat should be transported in a car or the cab of the moving van – not the back of the moving van or the trunk of the car. Wedge the carrier securely on the car floor or hold it in place on the seat with a seatbelt. If embarking on a long journey, stop to provide food, water, and litter box options at some point, being sure to attach a harness and leash before letting the cat out of her carrier so that she can’t run off and get lost in a strange area. If the day is hot, leave a window open or the air conditioner on. Don’t leave the cat alone in the car if stopping for a break. Bring the cat in first, before unpacking anything else, along with her food and water bowls, cat box, and other equipment. Confine the cat to one room, and, if possible, sit with her or have someone else sit with her while she explores her new surroundings. Bring in a familiar-smelling piece of furniture or other well-known item to make the new room feel more like home. Make sure that the cat has food, water, and a clean litter box before unpacking other items from the moving van. Place a note on the door of the room where the cat is confined to let those helping with the move know not to open that door – make sure that there are no open windows or other means of escape in the cat room. Use a plug-in feline pheromone product such as a Feliway diffuser to help calm the cat throughout the moving process and encourage her to accept the new environment. Once everything is moved in and doors and windows are shut, allow the cat out of the room to investigate her new home (block access to any rooms where a nervous cat could squeeze into narrow gaps to hide, such as utility rooms). Remain calm while the cat is exploring to let her know that the new home is a safe environment. Some people recommend buttering a cat’s paws after a move to prevent her from wandering. This is a myth. The only benefit of the butter is that the cat will probably enjoy the taste of it when she licks it off. Don’t carry the cat outside – let her explore at her own pace when she’s ready. Feed her before letting her out – hunger may cause her to wander far away in search of food. Accompany the cat on her first outdoor excursions into the yard. If she’s harness-trained, take her on a walk around the property. Bold cats usually adapt quickly, but timid cats may require accompaniment for quite a few excursions before they feel comfortable going out on their own. Chase other cats away from the garden to help the new cat establish herself as the owner of the territory. Make sure that the cat can get inside immediately whenever something frightens her. Initially, this usually requires leaving the door open. Purchase a magnetically or electronically controlled cat flap, as this prevents strange cats and other animals from coming inside. This is important, as such invasions can be traumatic for a cat in a new home, and can lead to problems such as urinating or defecating outside the litter box due to stress or a need to mark territory. Territorial conflicts are common when a new cat arrives in the neighbourhood. An owner who hears the sounds of a cat fight while his cat is outdoors should find her and check her for injuries. Letting cats outdoors puts them at risk for a variety of dangers, including cars, predators, and toxic substances. Consider building or purchasing a cat enclosure or cat fence. If cats begin to fight either during the move due to panic or afterwards as they attempt to establish new territories, it may be necessary to give each her own room initially or find some other way to separate them until they have calmed down. In this case, be sure that each cat has some familiar, comforting objects and her own litter box and food and water bowls.